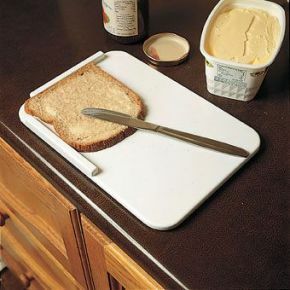 This bread spreader board lies flat on any table or work surface and provides a secure base to spread your favourite butter, jam or other food onto your bread slices. It has raised edges on its corner that stops the bread from moving when spreading on to it, making it ideal for elderly or disabled users. A simple and clever design that promotes user independence and confidence.